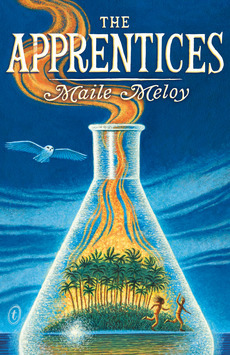 Maile Meloy writes adventure stories that are a lovely blend of real life and fantasy. Her characters are strong and her words are sprinkled with magic. She is an American writer and The Apprentices is her second book for kids. It is a sequel to her first book, The Apothecary. It’s Benjamin Burrow’s dad who is the Apothecary. An apothecary is what people used to call a pharmacist. But Benjamin’s dad is no ordinary pharmacist. He has special powers. He is able to mix unusual concoctions and spells by using formulas from the Pharmacopoeia- a 700 year old leather bound book stuffed with medical and magical secrets that their ancestors had passed down. Benjamin is one of his father’s apprentices and he is learning fast. The Apprentices is set in 1954. Benjamin Burrows and his dad are in war torn jungles of Vietnam using their elixirs to heal the sick and wounded. But we learn their real mission is to use their alchemical wizardry to save the world from atomic annihilation. In the beginning Jane Scott, age 16, is in a posh boarding school in New Hampshire called Grayson Academy. She hasn’t seen Benjamin for 2 years, but when she receives some cryptic letters from him she tries to work out where in the world he is. Meanwhile, Janie is working on her own important experiment- a method for extracting salt from sea water. When she is wrongly accused of cheating in a test Janie is expelled from school and her experiment mysteriously disappears. Who stole her experiment? Janie thinks she knows. This sparks a string of events that lead us on an enchanted chase across the Pacific Ocean. Just imagine what it would be like if you could turn yourself into a bird, breathe underwater or see inside someone’s mind. How would you feel if you were in a small boat being tossed about in a wild storm? What would you do if you were locked inside a cage in an underground uranium mine? I suggest you read the book to find out. It is unusual to have illustrations scattered through a book like this. Ian Schoenherr’s delightful black and white illustrations add to the atmosphere of this exciting, well-paced story.